Amy Winehouse may have opened the door to the neo-Soul singer explosion of the past couple of years, but since then no one has won the acclaim of critics and fans like Adele. On February 22nd the young Brit returns with her second offering 21. It's not an overstatement to say that Adele is one of the biggest voices to come along in some time. Her vocals are rich and booming, and as such the song should merely be vehicles to showcase her singular pipes. And they definitely do that on 21. Adele has the unique ability to make a song grand with her voice alone. Yes, the arrangements on songs like "Set Fire To the Rain" or the Gospel-infused "I'll Be Waiting", are sweeping, but they are truly only filling the space created by the vocals. On occasion, such as the album opener and lead single "Rolling In the Deep", the arrangements do verge on overpowering. For the most part though, they are tapered enough to keep the vocals as the focal point, as they should be. There are a handful of songs that strike you as unremarkable, but the only true failure would be "Don't You Remember". That track features a slight twang that is incredibly out of place among the rest of the music. Adele deftly tackles one of my favorite songs from The Cure, "Lovesong", on the record. In a change from the rest of the album, she shows restraint when delivery the delicate song, and it works marvelously. With 21 Adele takes another step in separating herself from the Duffys and Wineshouses of the world. Adele plays the Kool Haus in Toronto on May 18th. Best tracks: "I'll Be Waiting", "Set Fire To The Rain"
Thanks for sharing the review! I'm a huge fan and can't wait for her CD to come out on the 22. 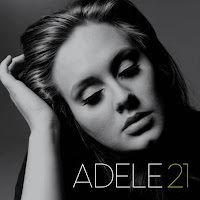 Have you checked out www.adele.tv ? She's having the "21 Days of Adele" and releasing something new everyday. Definitely worth checking out.